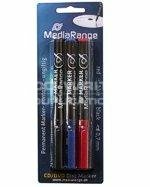 A pack of CD/DVD marker pens containing three pens (red, blue and black). CD . Marker . Pens . 3 . pens . - . Unbranded .